Now I realize that there are probably a million different messages on the promises that are found in Psalms 23, so today, I hope to offer a unique perspective, by not talking so much about the promises in Psalms 23 but instead looking at it from a different perspective. Now to be honest with you, it’s hard for me to imagine when I look at all the promises given to us Psalms 23, that there is anyone who doesn't want the Lord to be their shepherd. But the reality is there are people who reject God as their savior. And the question is why? Why don’t they want these promises. Well, it’s because they have fallen for a lot of lies… lies that Satan feeds people in order to get them to reject Jesus as their savior. The problem is, when they fall for the lie, what they believe is happening is not the reality of what is actually happening. It's kind of like the picture of above. There are perceptions and misconceptions and then there is reality! So, the perspective we want to look at Psalm 23 from today, is we want to see what the reality is when people fall for these lies that cause them to reject the promises given to us in Psalm 23. The Promise: "The Lord is my shepherd; I have what I need." The lie: I am my own master and I can supply my own needs. I am in control. The reality: The world (our job, our money, our family, everything but God and anything but ourselves) is our master. When the Lord is not our shepherd, these are the things that are in control of our lives. And the things that world has given us to take care of our needs… can be gone in a minute. The security we have in jobs, money, family and anything but God, is only an illusion. The Promise: He lets me lie down in green pastures; he leads me beside quiet waters. The lie: I lie down wherever I want. I go wherever I want to go. I do what I want to do. 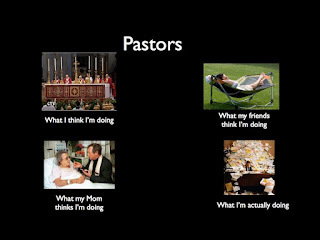 The reality: You never have spiritual rest. You are constantly at battle and trying to please everyone in the world. Furthermore, the water that the world leads you to, to refresh your spirit is not a still quiet waters… instead it is a stagnant pool filled with all kinds of harmful bacteria that you can’t see. At first it seems refreshing but later it will put a hurting on you. The water the world gives you is actually making you sick. The lie: I don't need renewing, I’m not sick. I am a good person. The reality: Just a like person who is addicted to drugs can’t see just how sick they are, neither can the sinner see just how spiritually sick they are. We need restoration. We need guidance to righteousness. When we lead ourselves, we continue down worldly paths. These path’s look attractive and right, but the problem is we are looking at the path without the light and every path looks attractive in the dark. The Promise: Even when I go through the darkest valley, I fear no danger, for you are with me; your rod and your staff—they comfort me. The lie: I’m doing just fine and I have nothing to fear. The reality: There are forces at work in this world that we have no idea about. When we are without God we are walking in darkness, and when we walk in darkness we have no clue as to just how close we are to danger nor do we realize just how quickly we get off the path. The Promise: You prepare a table before me in the presence of my enemies; you anoint my head with oil; my cup overflows. The lie: My table is already set, and I already have a feast before me. I have no enemies. The reality: What we have set before us is no feast compared to the feast God will set before us. When we fall for this lie, we think we have it all… but the truth is, we don’t even have any idea what a real feast looks like. And when we think we have no enemies, the truth is, we have spiritual enemies, we’ve just become friends with them. And when this happens they will steal from us, before we even know what happens. The Promise: Only goodness and faithful love will pursue me all the days of my life, and I will dwell in the house of the Lord as long as I live. The lie: Goodness and love already follow me, I’m set. The reality: It is a worldly love that follows you. And a worldly love will not last forever will only follow you for the rest of this life… and most of the time, not even that long. The goodness and love that follows you is only temporary, because it is worldly. Now, I didn’t really go into these with any real depth, we only scratched the surface of the promises, lies and realities of this scripture. But, before we go, there is one more thing I want us to think about. And that is, as Christians, what can we learn from these lies and realities? Here is the thing, I think that as Christians, sometimes we often lie to ourselves about the Lord being our shepherd. We think He is our shepherd and He probably was at one point in our lives, but somewhere down the road of life, we got off track and we slowly started falling for the lies. And bit by bit, and piece by piece, we have taken control of our lives back from God and we are no longer following Him. Instead we are living the life of the prodigal son. That is not to say that we are no longer saved, but we have strayed and once again, need the Lord as our Shepherd. And because it happened so slowly, the problem is, we don’t realize it. We still think God is our shepherd, and we keep waiting for these promises to come true, but since we have wandered so far off from the flock we are now following our own lead, which means we don’t have these promises. So, how can we identify when this happens in our live? We do it by evaluating what is going on in our lives and asking the quation “Is what we are experiencing in our lives the promises laid out here, or are they the realities that we just talked about?” If what we are experiencing are the realities, then the we have fallen for the lies and there is a good chance, the Lord is No Longer Our Shepherd. Is the lord My shepherd? Or is the world my shepherd? Is the lord In Control, or is everything and anything but God controlling my life? If you find that it is everything in the world that is in control of your life, then it’s time to make God your shepherd once again. Do I have everything I need (spiritually speaking)? If the lord is my shepherd, then I will have everything I need… or do I just think I have everything I need because my physical needs are met and I even have more than I need, but spiritually speaking, I am bankrupt? Am I able to get rest in the green pastures of God and be refreshed in my spirit? Or am I spiritually exhausted? If I am spiritual exhausted, then there is a good chance the Lord is not my shepherd. Is God renewing my life, and am I living righteously? Is God being glorified because of my renewed life? Or am I going down an unrighteous path where I believe I am glorified or where no one is glorified. If God is not being glorified through the renewing of my life, then there is a chance that the Lord is not my shepherd. Or have I even experienced a dark valley that the Lord has brought me through? If not, you are likely living under an illusion that everything is okay and it is not the Lord who is Leading you. Is God correcting me with His rod and His staff? And if so, does is it giving me comfort? If not, guess what? The lord is probably not your shepherd. If we aren’t experiencing correction, or if that correction doesn’t give us a peace of mind… then there is a good chance the Lord is not our shepherd. Do I have any spiritual enemies? If you don’t think you have any enemies then there is a good chance you have made friends with your enemies, and the reality is that they are keeping their friends close, and their enemies (that is you) even closer and the Lord, most certainly is not being your shepherd. Is God’s goodness and God’s faithful love chasing me down? If you have not experienced God’s goodness and are not aware of His love on a daily basis, then there is a mighty good chance, that somewhere down the line, you’ve strayed away from the Lord and he is no longer your shepherd. The good news is, if you have strayed from the flock and if everything and anything else but God is in control of your life… the good news is, that can end today. All we have to do, is let go and simply start following the Lord. Okay, I admit, that’s probably easier said than done. But the good news is that, if today you realize that this is where you are at, the best news is that the lie has now been exposed and you can begin searching for truth once again. That means it is time for a recommitment in your life and once again, giving God control in all areas of your life. Is the Lord or the world your shepherd?